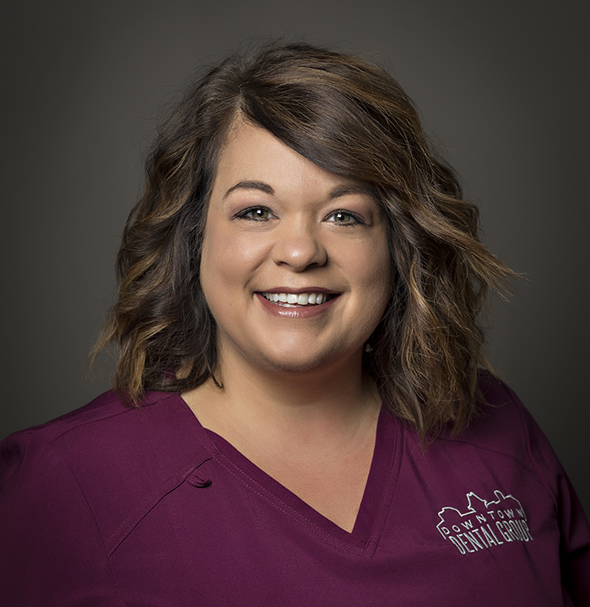 Kendra Metzger is a Dental Hygienist with Downtown Dental Group. She will be the first to tell you that she loves her patients! After 10 years of building relationships with them, she looks forward to watching families grow and providing care for several multigenerational families. After 10 years, Kendra also has a lot of fond memories at DDG. One Christmas party in particular is her favorite. They had a murder mystery party, and everyone stepped up their game to make for a very fun night. Kendra played the part of Barbie, a ditzy Hollywood actress. They had a ton of belly laughs that night! Kendra was always drawn to the science and healthcare professions growing up. In a high school Anatomy and Physiology class, Kendra had the opportunity to shadow a professional at a medical practice of her choice. Her aunt is a dental assistant, so she spent time with her office. In the end, Kendra shadowed the hygienist the most and was intrigued by her career choice. When Kendra is not working, she is kept very busy with a toddler, and she recently welcomed another little one! Her family frequents the library, zoo, and Discovery Center. They also love to spend time with their dogs and frequently walk to Top of the World to get the whole family out of the house. Finally, Kendra and her family really enjoy spending time skiing in the mountains in the winter and on the lake in the summer. The best way to Kendra’s heart is though the nostalgia of local coffee shops, visits to the Kansas State University Gardens, and watching KU basketball at the Allen Fieldhouse! Her Achilles’ heel is anything and everything sweet! She has a major sweet tooth. Something Kendra would like her patients to know is that oral health is truly the gateway to an overall healthy body. Many serious injuries can be associated with your oral health including diabetes, heart problems, strokes, and premature birth. Seeing your dentist and dental hygienist regularly is about more than just your smile!